You want to remove something from an image on your iPhone? As always, there’s an app for that. Here’s a quick test of two. Links: Touch Retouch and Photo Fixer. Brush a red layer on what you want to remove. On this image it kept giving me a message about the fact that the area was too large. So I gave up. Problem with too large selection. I decided to do it in several steps. My conclusion after this quick test is that Touch Retouch is easier to use, is faster and gives better results than Photo Fixer. But Photo Fixer is the new kid on the block and will probably mature as it gets updated etc. So keep an eye on both of them. See the comments. One of my requested features is a sort of popup that shows what’s going on under your finger. The people behind TouchRetouch tells me that this is coming in version 2.0 later in November. Looking forward to that. And it’s very nice to see that both developers have contacted me because of this quick review. I’ll keep an eye on both these apps. ← Get out and snap some images! My name is Adam Uccello and I’m the developer of Photo Fixer. Thanks for reviewing my app! I’m excited with the attention that Photo Fixer has received and am in the process of making some pretty major improvements in performance and quality. The update should be released in the next week or so. If you have any suggestions on things to improve I’d be happy to hear them. As a side note, once you’ve removed an item (and the green bounding box is showing), if you don’t like the results, you can hit the ‘erase’ button again. Photo Fixer uses a random seed as part of its processing, so running it multiple times will often given significantly different results. Use of a “pop-out magnifying glass” while selecting the object you want to remove. Your finger hides the details of what’s happening when you select an object. 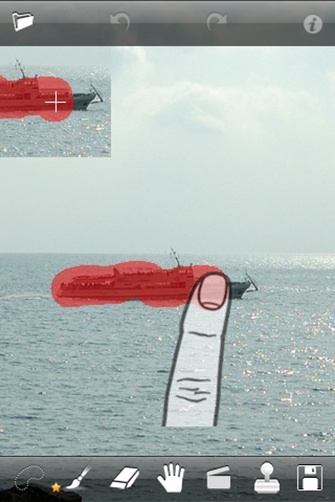 For both apps it is impossible to be accurate because your finger is in front of the area where you are drawing the selection. When moving the cursor and selecting text on the iPhone you get a magnifying glass that pops up above your finger to show exactly where the cursor is placed. You should use the same method when people select an area. That would increase the possibility for accuracy when selecting drastically. Have a look at how they have solved selecting and adjusting the arrows in the app called “My Measures”. It would be impossible to place the measuring arrows accurately without the magnifying glass.